Cinderella is an American heavy metal band from Philadelphia, Pennsylvania. They emerged in the mid-1980s with a series of multi-platinumalbums and hit singles whose music videos received heavy MTV rotation. They were famous for being a glam metal band, but then shifted over towards a more hard rock/blues-rock sound. By the mid-1990s, the band’s popularity declined severely due to personal setbacks, break-ups, and changes in music industry. Nonetheless, after a period of hiatus the band reunited and is still active at present. The band has sold 20 million albums worldwide. Cinderella was formed in Philadelphia in 1983 by singer-songwriter, keyboardist, and guitarist Tom Keifer and bassist Eric Brittingham. The initial lineup also included guitarist Michael Smerick and drummer Tony Destra. In 1985, Smerick and Destra left to form Britny Fox, another Philadelphia-based glam metal band that later relocated to Los Angeles. Cinderella got their big break when Jon Bon Jovi saw them perform at theEmpire Rock Club in Philadelphia and recommended that his A&R rep Derek Shulman who knew of the band, see them as well. In 1985, with arecording contract with Mercury/Polygram Records in the works, guitarist Jeff LaBar and drummer Jim Drnec joined the band. During the recording of the band’s debut album, Night Songs, studio session drummer Jody Cortez was brought in to help. While finishing the recording, Drnec was replaced by former London drummer Fred Coury, who joined in time to make the album’s cover and play on upcoming tours.Night Songs was released on August 2, 1986 and eventually achieved triple platinum status, selling 50,000 copies per week at one point. The album reached #3 on the Billboard charts in February 1987. By the end of 1987, the band released a video compilation called “Night Songs” to accompany the album, featuring the promotional videos from the album plus 3 live songs recorded on their 1986 tour. Cinderella’s first tour was in 1986 with fellow glam metal rockers Poison, opening for Japanese heavy metal band Loudness. Further tours into 1987 were spent playing to large arena audiences: five months opening for former Van Halen frontman David Lee Roth, and seven months with Bon Jovi, taking the opening slot for their Slippery When Wet tour. Later that year, the band went overseas, appearing in Japan, Scandinavia, and at theMonsters of Rock festivals in United Kingdom and Germany. Cinderella’s second album, Long Cold Winter, was released in 1988. It signified a shift towards a blues-rock sound, though it could still be described as glam metal. A 254-show tour to support the album lasted over 14 months and included dates on the Moscow Music Peace Festivalalongside other metal acts, such as Ozzy Osbourne, Scorpions, Mötley Crüe, Bon Jovi, and Skid Row. The tour’s stage show included Tom Keifer being lowered to the stage while playing a white piano during their radio hit “Don’t Know What You Got (Till It’s Gone)“. On April 17, 1990, the band released another accompanying Video called “Tales from the Gypsy Road” featuring the 4 promo videos plus 2 live medleys, the second of which contained a cover ofLynyrd Skynyrd‘s famous “Sweet Home Alabama“. Cinderella’s third album, Heartbreak Station, was released in 1990. It featured more songs than Long Cold Winter that were influenced by Keifer’s love of the blues. Following the accompanying tour, Fred Coury left the band and joined former Ratt vocalist Stephen Pearcy in the band Arcade. In 1991, Keifer lost his voice due to a paresis of his vocal cords. He underwent several surgeries to repair a vocal cyst and hemorrhage. This added to delays in the recording of the band’s fourth album, Still Climbing. It was finally released in 1994 with Kenny Aronoff on drums, but the album quickly disappeared from the charts. Mercury Records consequently dropped the band which went on hiatus in 1995. Cinderella resumed activity in 1996, the same year Mercury Records released a greatest hits compilation titled Once Upon A…. The group toured the United States in 1998, with one stop captured on the live album Live at the Key Club, which was released in 1999 through Cleopatra Records. Fans say Cinderella was one of the best of the “80s hard rock” bands with exceptional song-writing and solid live performances. In 1997 Mercury Records released a video compilation containing all of the bands promo videos from the first 3 albums. Around 1999, the band was signed by John Kalodner to Sony Records. However, the band was dropped by the label before a new album could be released, plunging the band into three years of litigation. Cinderella toured again in 2000 and 2002. Cinderella headlined the VH1 Classic Rock Never Stops 2005 summer tour. Also in 2005, Cinderella toured with FireHouse, RATT, and Quiet Riot. Mercury Records released the compilationRocked, Wired & Bluesed: The Greatest Hits on CD and DVD. In 2006 Cinderella toured with Poison. Both bands celebrated the 20th anniversary of their debut albums, Night Songs and Look What the Cat Dragged In. 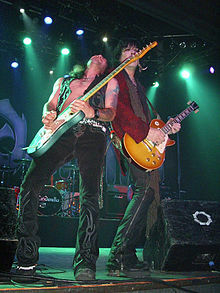 Cinderella planned to tour in 2008 withWarrant, Lynch Mob, and Lynam, but on June 13 that year, Tim Heyne, the band’s manager, said in a press release: “It is with unbelievably deep regret that I must announce that Cinderella’s Tom Keifer’s left vocal cord has hemorrhaged, thereby making it impossible for him to sing in the immediate future.” Lebar was interviewed by Ultimate-Guitar and stated that Cinderella would love to make a new record but there were obstacles holding the group back. They still were not signed to a record label after Sony dropped the band in 2000. Lebar also stated that he is busy with his new band, Freakshow, which features Frankie Banali of Quiet Riot, and Eric is busy with Naked Beggars. A message posted to the Cinderella message board in spring of 2009 stated that Keifer’s voice has returned to normal. Promoters from the 2009 Rock Gone Wild Festival confirmed that the band was scheduled to perform at two festivals in late summer or early fall of 2009. Tom Keifer and Jeff LaBar playing inMadrid, Spain in June 2010. Cinderella confirmed on their message board that they would be touring in 2010 with two warm up dates already confirmed. It was announced on February 22 that Cinderella will be a part of Rocklahoma 2010 in Pryor Oklahoma and Sweden Rock Festival 2010. On February 26, 2010, it was announced that Cinderella will be the headliner of the MSC Poesia sailing from Fort Lauderdale on November 11, 2010. Cinderella are confirmed for the Main Stage at the Download Festival, at Donington Park, England in June 2010. July 2010 sees Cinderella taking the stage to open for Bret Michaels, during the Common Ground Music Festival in Lansing, MI, with an original line-up of stars including Tom Keifer, Eric Brittingham, Jeff LaBar and Fred Coury. They will then follow that with 14 dates in the US supporting Scorpions on their Get Your Sting and Blackout farewell tour. Cinderella played at the Download festival in the UK in June 2010, the Rock Jam near Grand Junction, Colorado, Friday, August 27, and also the Oregon State Fair on September 4, 2010. In November 2010 Cinderella joined a variety of other hard rock acts on the cruise entitled “ShipRocked“. In 2011 Cinderella undertook a 25th anniversary world tour. 20 shows were confirmed from April through July. During the tour, they headlined the first edition of the “Shout It Out Loud” Festival in Germany.